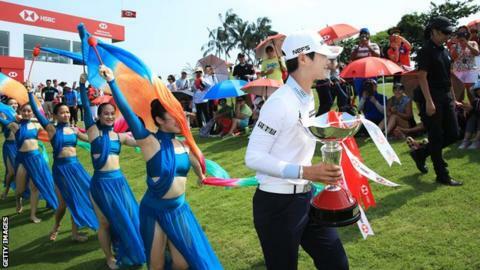 South Korea's Park Sung-hyun finished on 15 under to win the Women's World Championship by two shots in Singapore. The two-time major winner, 25, started the day four shots off the lead, but had nine birdies in an eight-under 64. Her nearest challenger was Australia's Minjee Lee on 13 under. Thailand's world number one Ariya Jutanugarn, who held a one-shot overnight lead, closed with a 75 to finish joint eighth on eight under with England's Jodi Ewart Shadoff (73). Ewart Shadoff, who made only one bogey in the opening three rounds and started Sunday two shots off the lead, dropped a shot at the first. She cancelled that out with a birdie on the ninth but immediately double-bogeyed the 10th to effectively end her challenge. Park charged up the leaderboard after holing five birdies in her opening seven holes. A bogey on the eighth was wiped out by a sixth birdie of the day on the 10th, with three more birdies taking her clear of Lee. Australian Lee picked up four shots in 12 holes to keep up the pressure but she was only able to register four pars after bogeying the 14th to finish in second. England's Bronte Law (72) finished on one under, with Georgia Hall (73) on two over while Charley Hull's seven-over 79 saw her close on 10 over, five ahead of Scotland's Catriona Matthew (73).